On November 16 at the Yaese Town Central Hall, junior high-school students performed kumiodori entirely in Uchinaguchi. Uchinaguchi (Okinawan language) has words that cannot be pronounced using the 50 Japanese syllabary. In this respect, the difficulty of using the Japanese writing system to read Uchinaguchi aloud has limited the spread of the language and passing it on to the next generation. In seeking solutions, Okinawan language researchers have created a special play script using the 50 Japanese syllabary plus 23 more Okinawan characters. 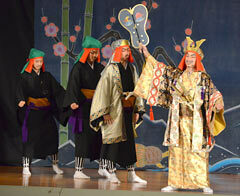 Kochinda Junior High School in Yaese Town experimented with the script in their kumiodori class. On November 16 at the Town Hall, the students performed the kumiodori called Migawari chujo, which is set in Yaese Town. Yaese Town Board of Education member Takeshi Kamiya, who is also a kumiodori actor, had found an easy-to-follow script, which he suggested that the school try with its Okinawan characters. Shinsei Kuniyoshi, of the Tokyo Branch of the Association for Okinawan Languages, wrote the script and Funazu Yoshiaki, a friend of Kuniyoshi, designed the Okinawan characters about 30 years ago. At the performance the students proudly delivered their lines entirely in Uchinaguchi. 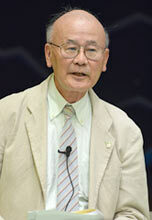 One of them, Yudai Miyagi, said, “Losing Uchinaguchi speakers is a serious problem. We want to pass the language on to the next generation.” The performance included a lecture by Kuniyoshi and a professional dance.